The Barbie doll. That lifelong childhood friend we’ve always had. The one (inanimate) person in our lives that’s always believed in us whether we wanted to be a doctor, teacher, basketball player or taught us how to be a real friend (cue the orchestra please). Mattel, the company that has assembled Ruth Handler‘s creation of Barbara Millicent Rogers since March 1959, in a surprising announcement–courtesy of a stunning TIME magazine cover–that Barbie would now be available in four body shapes including petite, curvy, and tall, seven skin tones, and various eye colors, hair hues and textures (alongside the last prior design. Barbie’s 2013 face looks different from say 1993 Barbie). 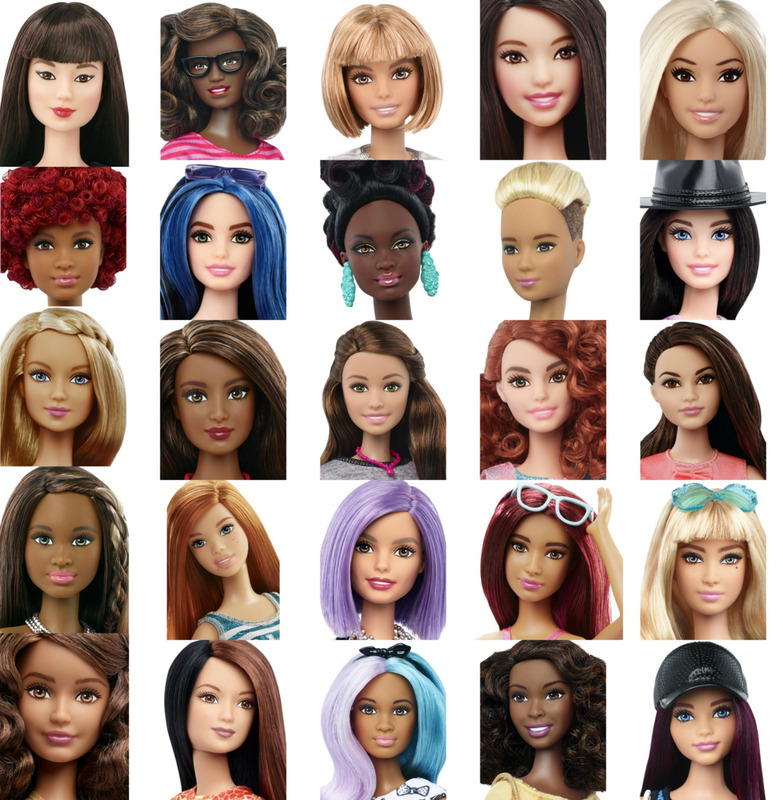 With the hashtag of #TheDollEvolves, the toy news swept social media. And longtime fans, many well into their adulthood, praised the new era of Barbie while also sharing warm memories of their childhood days with Millicent. She sure has come a long way. And with it, has American journalism finally taken the leap and challenge to talk about the female body and its array of shapes in a more nuanced approach? No body left behind I say, whether you’re thick or thin! The group most likely to play with these new Barbies may remain of the twelve and under set. But we got to teach our girls about self-esteem and body positive image sooner than later! From #TheDollEvolves, it got me thinking… When I was consumed with Barbie dolls. Now looking more like the rest of us than ever before, did I as a child ever feel body shamed or pressured by Barbie’s lithe yet plastic body? 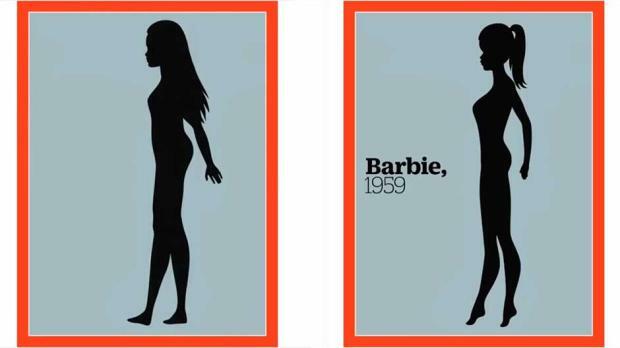 In the years since I was a kid, many critiques have made been about Barbie’s image and contribution to beauty and health. Hence, this is why I mentioned above that the inaugurated batch I had were mainly of the original standard: White and blonde. I, in my real life human form, I do not share the same physicalities or color as Barbie. I am brown skin with dark brown eyes and back then as a child, I had big, long, fluffy textured hair. And body-wise as an adult, I’m a US 6-8. (White) Barbie and I are nothing alike! Yet I never intrinsically felt like she was the standard or her image was forced placed upon me such. And with a mother like mine and having been a kid when I was, I know altogether that had a lot to do with my psyche regarding dolls. It was not out of the ordinary to see a Black Barbie astronaut or gymnast. And even when mama and I did get the Black Barbies, I knew my homegirls weren’t real either. (Though it was a blast to have Christie. There is something beautiful about seeing yourself reflected even if I wasn’t nowhere as glamorous). Body and self-esteem body issues were definitely not cramping this little girl’s vibes. If anything, they were boosted during those glory days of 1990s popular culture. On average, most of the criticisms about Barbie have zeroed in on her body shape and with claims that the iconic one was too thin and her impossibly unrealistic body was a poor image for young girls to have. Throughout the 2000s, countless publications and media savvy scientists and doctors published reports on just how unattainable and virtually “It ain’t gonna happen” Barbie’s body measurements actually were. It was the secret obsession of investigative journalism. In 2011, former Hamilton College student Galia Slayen, via Huffington Post College, wrote about her personal mission to discover what Barbie would look like if she was homo sapien. Slayen was shocked to learned that if she was real, she would have “pencil-thin legs, breasts that [would] topple her over and a body mass index (BMI)” number of 16.24, undoubtedly causing her to suffer from anorexic-like conditions. Poor thing would be so disproportionate, she wouldn’t be able to have a menstrual cycle, be a size 3 in shoes, and forced to walk on all fours just to get anywhere. Not a dream scenario for a woman that supposedly lays her head at night in an enviable dream house and drives a pink convertible. But such scary stats and the major remaining fact that Barbie is a toy, a playful fantasy at best and not to be taking seriously as far as physical expectations go, hasn’t stopped some Barbie fan girls (women) from still attempting to literally look like her in extremely unhealthy manners. Dressing up like our favorite doll is one thing. Getting plastic surgery to achieve her disappearing act of a waist line is another. Valerie Lukvanova has made somewhat of a modest career for her notorious living situation as the “Human Barbie.” On the homepage of her official website, without having to click on a link or barely scroll, her waist to hip ratio and bra size are listed just to prove how closely she mimics the apple of our plastic dreams. The Ukrainian model has admitted to breast implants but insists that she maintains her Barbie body through a strict diet and exercise routine. Lukvanova was also the subject of a VICE documentary called Space Barbie and has been ridiculed worldwide for her odd, somewhat uncomfortable appearance (accented by anime character contacts). Yet on the flip side of a judgmental media, has also mesmerized those same critics and curious voyeurs. Barbie never intended to be a juxtaposition of being this delightful toy for girls and such a controversial example in the thick, heavy folder of rigid standards for female beauty and sexuality. The doll has been used in irreverent manners of societal commentary and art such as 1987’s Superstar: The Karen Carpenter, a biopic about the ’70s blue-eyed soul singer done entirely with Barbies. And of course, there are those SNL skits, and photography of a deranged Barbie killing Ken and loving it, as imagined and set up by artist Mariel Clayton. And decapitated Barbie dolls stuck in a see-through heel bootie by Jeffrey Campbell anyone? After decades of talks and rumors of when Mattel would finally release a realistic looking Barbie, the company somewhat implied that they were working on it but a date was never marked. Until January 2016. In late January 2016, Barbie and Mattel’s big announcement of #TheDollEvolves arrived, as the history of the doll and newest chapter elicited born again interest and just how influential the toy really was (or in reality, still is. YouTube “Barbie’s Dream House” and the computer-animated movie has been viewed into the 20+ million. And Jeremy Scott‘s Barbie collection for Moschino was a grown woman’s super into campy fashion ultimate wish). 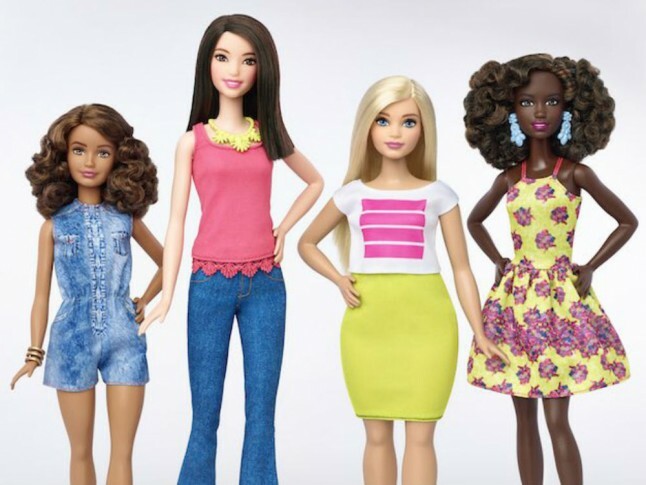 While I never felt pressured by Barbie’s body (real humans have actually caused me anxiety), I think it’s wonderful what Mattel is doing right now. It’s the most innovative they’ve been in years and their mission to showcase not just different Barbies in body shapes but in personalities and styles truly shine through. There is a Barbie with split lavender and aquamarine hair (think Nicki Minaj‘s wig in the “Knockout” video) and dolls with big-framed glasses. Short hair, freckles, preppy, sporty, punky, girly, a fire engine Afro, Asian Barbies, chocolate brown toned. A blonde with BROWN eyes. They really are amazing! Barbie took the reigns of the notion that the limits were endless. In its 57-year history, the Barbie doll has never been more current, relatable, and I think for the first time ever, rebellious, but still charmingly so. If this is the kind of landscape for today’s girls in our time of Snapchat, gossip Instagram, and Kylie Jenner, and where it’s okay to advocate having blue hair and wanting to be a baker, writer or physician, both I and my inner ’90s child co-sign this Barbie movement. Welcome back! (And though you never left). And sidenote: The Poet Project is looking forward to the “dad bod” version of Ken.